A virtual evolution in IT shops large and small has begun. VMware's ESX Server is the enterprise tool to free your infrastructure from its physical limitations providing the great transformation into a virtual environment--this book shows you how. 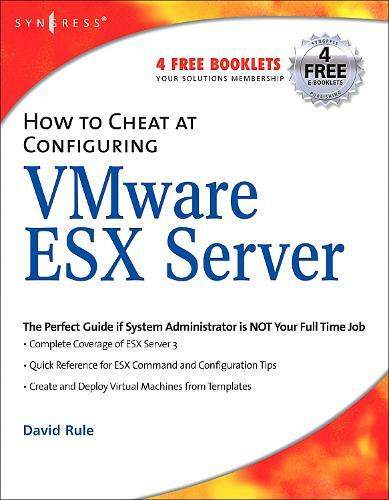 Use Syngress' proven "How to Cheat" methodology to configure and build VMware's ESX Server version 3. This clear, concise guide provides all the information you need to become a virtual whiz! This book will detail the default and custom installation of VMware's ESX server as well as basic and advanced virtual machine configurations. It will then walk the reader through post installation configurations including installation and configuration of VirtualCenter. From here, readers will learn to efficiently create and deploy virtual machine templates. Best practices for securing and backing up your virtual environment are also provided. The book concludes with a series of handy, time-saving command and configuration for: bash shell keystrokes, Linux commands, configuration files, common/proc files, VMware ESX commands, and troubleshooting.